My son caught his daughter making friends with a very shy kitten last summer and sent the image on to me. The November Market Street kit from Swirlydoos gave me the perfect opportunity to scrap this adorable photo. For my base, I selected the Faded Bloom sheet from the 49 and Market Heirloom Botanicals collection. I love the peach shades and the pattern that is so reminiscent of the vintage wallpaper that would be found in a girl's bedroom. 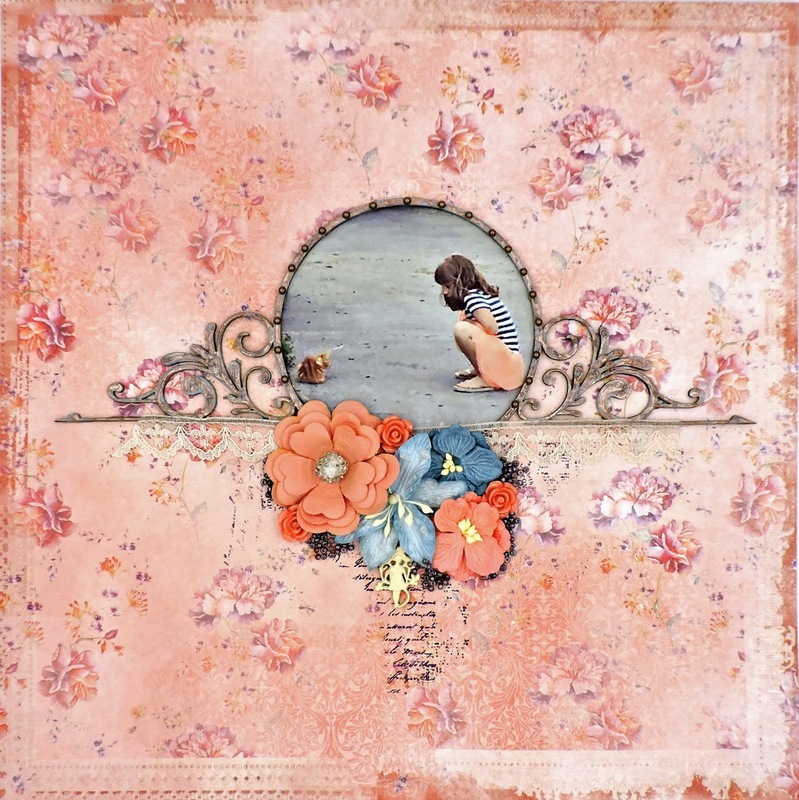 A few weeks ago, DT Coordinator Kim Heard posted links to some older tutorials showing various ways to alter chipboard http://swirlydoos.blogspot.com/2016/12/saturday-altering-chipboard-tutorial.html. I chose the first technique - Rae Moses' distressed faux filigree chipboard https://www.youtube.com/watch?v=IL3WVGd0Wu4, using Ranger Liquid Pearls in Rose Gold and Prima Color Bloom in Storm Cloud to alter the Dusty Attic Decorative Frame #2 that came in the kit. As a finishing touch, I adhered some Darice self-adhesive pearls around the circle. Before adhering my completed frame, I did a bit of stamping below with a script stamp and Versa Magic chalk ink in Eggplant. My embellishments are mostly from the Main Kit and the Flower Add-On, using 49 and Market blooms and some resin flowers from Craft Consortium's Always and Forever Collection, with one of the Prima Fairy Rhymes trinkets dangling on the bottom. The lace and large flower are from my stash. I completed my cluster with Prima Art Ingredients Glass Beads in Licorice.